Selected as one of the three best "Europe Destination Spas" by the World Spa Awards, the VICHY CÉLESTINS Spa Hôtel was recognized for the entire range of services it offers. The World Spa Awards recognize the best "Destination Spas" on every continent. In Europe, the three Spas selected were au VICHY CÉLESTINS Spa Hôtel and the Sources de Caudalie in France, and the Lanserhof in Austria. A Destination Spa should offer a unique high-end experience in an environment that is entirely devoted to health and the individual restoration of each client. 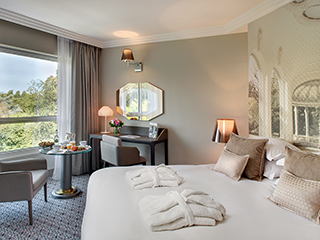 The au VICHY CÉLESTINS Spa Hôtel is the only "Spa" in the world that also offers an on-site Institut des Laboratoires Vichy. Since "taking care of oneself" also involves taking time for body and spirit, beyond our fitness and health "break" opportunities, we also offer a highly qualified medical service, personalized support from physicians and experts, as well as slimming, detox, fitness, and anti-aging programs that are comprehensive and targeted, along with the utmost in equipment and Signature treatment options featuring Vichy thermal water. So come discover the Thermal Spa Les Célestins, with its 7500 m2 under a dome of light set in the splendid Napoléon III park, only 3h from Paris and 150 km from Lyon. The selection of "Destination Spas" for each continent has been entrusted to seven expert judges certified by the World Spa Awards. First, a mystery guest comes to the Spa for two days. In fact, this is a visit from an incognito inspector. This person gets a sample of our reception and the treatments and services we provide. Next, an announced visit is made by a judge. This second visit lasts several days. The judge inspects the site, analyzes the offerings, evaluates the services and activities, and meets the directors and personnel.